Very pleasant weather the past few days looks to continue right into the weekend as cool high pressure builds over the region through Saturday before shifting to the east, starting our next warm-up. 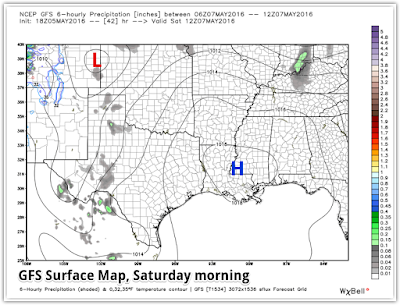 By early next week, southerly flow around the high will bring rain and thunderstorm chances back into the forecast. Over the past few days, the upper levels of the atmosphere in the eastern U.S. have been dominated by low pressure, which has brought the cooler than average temperatures. However, high pressure at the surface has meant tranquil conditions. A nice combination if you want dry but pleasant weather! Lows in the 40s outside the city have been a bit cool, but afternoon highs have been very nice. This continues into Friday with another cool morning followed by mid 70s for highs. It'll be a great night to check out the Aquarids meteor shower if you don't mind getting up early! By Saturday, high pressure moves by to our south with another sunny day on tap, but wind starts to shift from the south. In addition, high pressure builds overhead as the low aloft shifts east, allowing temperatures to rebound back above 80 Saturday afternoon. In fact, the pattern at 18,000' will include high pressure over our region, but twin upper level lows near the east and west coasts - another "Omega Block" like we discussed a few weeks ago. Once again, this one will be fairly transient as the pattern shifts again early next week. Sunday will be another warm but dry day with morning lows moderating quite a bit thanks to the south wind. A high-amplitude upper level (18,000') pattern will be present over North America early this weekend as anomalously low pressure sits along the east coast and southwest U.S. with a ridge of high pressure between. 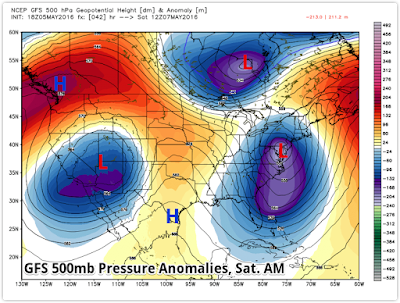 The upper level ridge will build over the Mid-South during the weekend, providing warming temperatures and dry conditions. 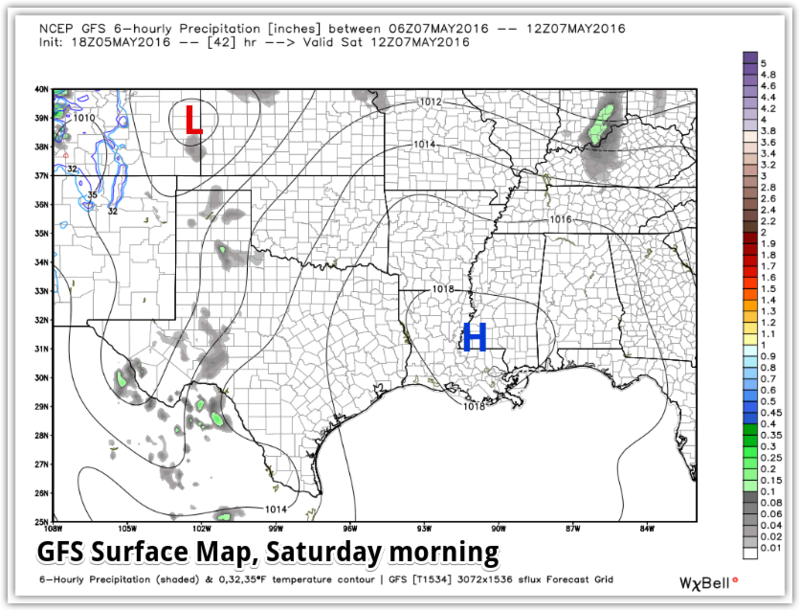 Saturday morning, surface high pressure over the Lower Mississippi Valley will mean very nice weather to start the weekend, but with wind shifting southerly, it will be warmer with highs back in the 80s Saturday and Sunday. Graphic courtesy WxBell. On Sunday, a developing storm system (low pressure) cranks up in the Plains with a threat of severe weather in that region. 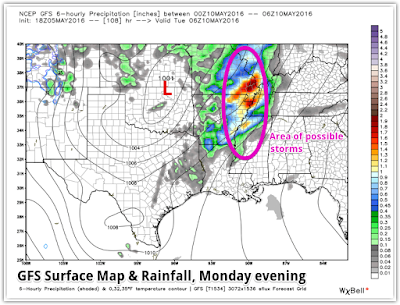 That system will slowly shift east Monday when thunderstorm chances increase over the Mid-South by late in the day. Medium-range models differ a bit on details, but the American/GFS model (shown below) thinks we may be getting some strong storms with heavy rain by evening. The GFS model shows strong low pressure over the southern Plains on Monday evening with an area of thunderstorms well out ahead of it over the Mid-South. The European model (not shown) is not quite as aggressive, but it does signal the beginning of a period of inclement weather next week. Graphic courtesy WxBell. Beyond Monday, the overall pattern remains unstable and wet for a few days. Of course, with the return of the World Championship Barbecue Cooking Contest Thursday through Saturday, we're hoping that the system moves east of us by the end of the week! But it appears right now that the first day or so of the second event of Memphis in Mud will see a decent chance of living up to it's name. I like wet ribs, but not soggy! Both the GFS model and the European seem to think that conditions improve by Friday and Saturday. We'll cross our fingers and pig's feet! 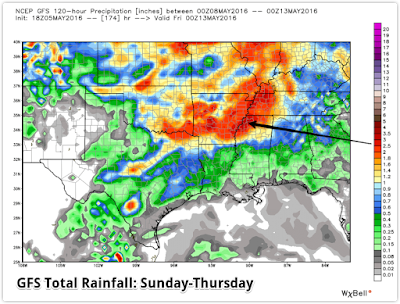 The GFS model projects rainfall totals in the 2"+ range for the first few days of next week due to repeated chances of rain and thunderstorms in an unstable atmosphere. Graphic courtesy WxBell. We'll keep you updated as the wet pattern returns early next week. In the meantime, enjoy some amazing spring weather through the weekend. 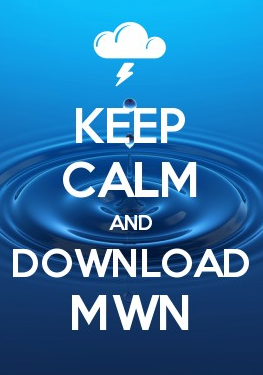 The official MWN Forecast can be found by clicking here.